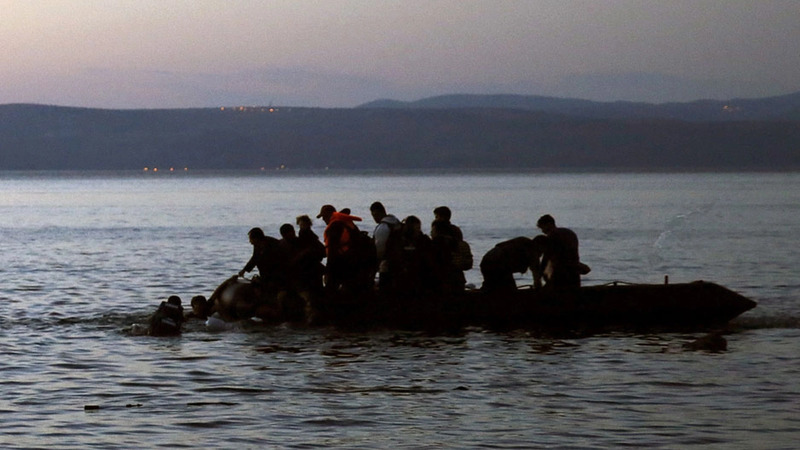 Experts discuss international approaches to the migration crisis in the Mediterranean. RUPP: I’m glad to welcome all of you. As you heard, this is an occasion that is on the record. We will speak up here for 25 minutes or half an hour, and then the floor will be open for participation from all of you. So save up your questions as you listen to the presentations. We have two very distinguished guests. And you have their bios in front of you, but I’m going to rehearse them at a little more length than I might otherwise, because I think it’s important that we recognize just how much knowledge and information they being to this set of issues, that all of us are very aware of because we read the headlines each day, but which have much deeper roots and far-reaching implications looking forward. Peter Sutherland is the United Nations special representative of the secretary-general for migration and development. He’s held this position since 2006, and was responsible for creation of the Global Forum on Migration and Development. In addition, he’s the president of the International Catholic Migration Commission and a member of the migration advisory board of the International Organization for Migration. He was educated at Gonzaga College, University College Dublin and Kings Inns. And he studied civil law. He is—among a great many other involvements, he’s been the international advisor to Goldman Sachs and he has served on the boards of 13 major companies in Europe and the U.S. So he brings this combined involvement, both in the financial, economic sector and in the public governance organizations. I’m not going to mention all of his previous positions, but let me just give you a highlight to show the range. He previously served as attorney general of Ireland from 1981 to ’84, chairman of Allied Irish Banks, ’89 to ’93, founding director general of the World Trade Organization, chairman of the Trilateral Commission, chairman of the London School of Economics and Political Science, chairman of Goldman Sachs International. He has received 15 honorary degrees, published articles in law journals and also wrote and published a book on the implementation of the European common market, so very broad-gauge involvement that we will all benefit from hearing about. Ambassador William Lacy Swing of the United States was reelected to his second five-year term as director general of the International Organization for Migration. Bill and I had the chance to get to know each other when we—because we both lived in the same building, the Chanin Building at 42nd and Lex, when I was at the International Rescue Committee. Bill has a very long history of involvement with the U.N. in Africa. From May 2003 to January 2008 he was the U.N. special representative of the secretary-general for the Democratic Republic of Congo. He was involved in all facets of the U.N. peacekeeping operation—the largest one in history. He has a very distinguished diplomatic career, has spanned 40 years, his six postings as ambassador to South Africa, Nigeria, Liberia, the Democratic Republic of Congo, and the People’s Republic of Congo and Haiti. Bill Swing was named ambassador to the Republic of South Africa in 1989, shortly before Nelson Mandela’s release from prison. I sense this posting was a culmination of Bill’s career, because he began his diplomatic career 26 years earlier in Port Elizabeth, South Africa. And he then served as a distinguished fellow at Harvard University from ’76 to ’77, where he published a monograph, U.S.-Africa Policy and the Case of South Africa: Dilemmas and Priorities. He has a great many awards. You can read a small selection of them in the bio. But perhaps as a kind of summation of his diplomatic career, on June 26th, 2012, in a ceremony at the U.S. State Department, Ambassador Swing received the American Foreign Service Associations Award for lifetime contributions to American diplomacy. He has received a great many other honors, and I will not read all of them. He was born in 1934 in Lexington, North Carolina, and he graduated from Catawba College in North Carolina and Yale University, where he got a B.D., a bachelor’s of divinity, for those of you who don’t know that distinguished degree, and did post-graduate studies in Tubingen in Germany. He speaks French and German. He’s married to Yuen Cheong and they have a son, Brian, who lives in Cape Town, South Africa, and a daughter, Gabrielle, who is a United Nations peacekeeper in Afghanistan. So we have two very distinguished speakers. And they are going to help us to understand a global response to the Mediterranean migration crisis. We’ll start first with Peter and then Bill, and ask them to sketch how they see the crisis and the global response. And then we’ll have a little interaction before we open it up to others. Peter, we’ll start with you. SUTHERLAND: Well, let me start by a couple of personal reflections, after that very generous introduction. I suppose that I would like to think, although it’s an exaggeration, that a leitmotiv for me in political life has been the concept of integration and the antagonism which I feel towards nationalism, which I’ve seen too much of in my own country and elsewhere. and in the ’80s, I was in the European Commission when we were trying to bring together free movement of persons, capital, services, and goods, and then went to the WTO at a time when the iron curtain had just collapsed, and tried to bring Russia in to—at least China, particularly, into the global training system. So there was a process of integration with which one felt comfortable, in my case, because I profoundly believed in it. Some years later, in 2005, Kofi Annan contacted me and asked me to become involved, actually at the time, exploring the issue of becoming director general of the UNHCR. But that, at the time, I could not do. And he then asked me to become his representative—high representative for migration, which I’ve done since. At that time, it became abundantly clear that the atmosphere was very different than the one which has brought so many heads of government, prime ministers, and foreign ministers to discuss migration and the constructive engagement in the U.N. today—literally, today. The United States absolutely opposed any discussion in the U.N. on migration. John Bolton virtually threw me out of his office. He said that as far as the U.S. was concerned, migration was a matter of national sovereignty—stay off. If you’ve got some steam for developing some multilateral U.N.-type vision on migration, forget it. We’re going to block it. And in fact, the U.S. stepped aside. It didn’t block it, possibly because it couldn’t, but it certainly wasn’t in favor of preceding. There were others that were absent, on parade. Japan still absent on parade, I should say, on the subject, although being generous in the last day or two—significantly generous in financial terms. So the old issue of nationalism and national sovereignty was there from the beginning. And the Global Forum on Migration and Development was an attempt to create a non-binding mechanism for communication and dialogue between countries of origin, destination, and transit, and to try and begin a dialogue about a subject that was an inevitable concomitant of the whole issue of globalization, which is really what I’ve been talking about—a globalization which brought into play regional integration, free movement of people in Europe, global integration in terms of WTO and bringing countries previously outside into the global trading system and so on. So that’s a sort of a background, but it’s a necessary background. And then as events have transpired, inevitably, as Kofi Annan clearly indicated to me in that telephone call in 2005, he said: It’s inevitable that migration is going to become the key issue of our time. You’ve been all involved in the commercial aspects of this. Get involved in this. So that’s how I became involved. I was extremely lucky to have during the last bulk of my time a person with whom I could be, I think, joined at the hip working with me on the same issues in a more, I think, effective way, because of the organization, not least, that he led, and that’s Bill Swing, who’s a great guy. And the world isn’t full of great guys. I’ve met a lot of guys who were concerned about institutions, pushing their institutions, pushing themselves and so on. But he’s a great guy. And we moved to a time where a rolling disaster—and I’m not going to go into the causes of the rolling disaster in Syria, Eritrea, Afghanistan, Libya—that have created the conditions that inevitably give rise to huge migratory flows—wars always bring migratory flows—have brought an increasing challenge, a challenge which some politicians have met and others have ducked. Some have responded by expressions of position which I find repulsive. And I don’t mind identifying them. Some of the Central and Eastern European countries who have, for an example, said that in terms of refugees, which under the 1951 convention we are bound to provide sanctuary to, and in respect of which the principle of non-refoulement, sending back, is verboten and forbidden, they have said: We will take everybody as long as they’re Christians. This runs directly contrary to what the European Union is founded to do, more fundamentally what the United Nations is all about. We have those who have been arguing that borders and fences is the way to deal with the hemorrhaging of people desperate to escape the most dreadful conditions and persecution. We have already this year over 500,000 who have crossed the Mediterranean. God knows how many lives have been lost. Some people say 3,000. It may be much more. In fact, the 550,000 or 30,000 or whatever it is may also be far more. We don’t know, but we know the figures are enormous. And we know that the political reactions on the hoof around Europe have been very different. We get policy change literally on the hoof. The dreadful photograph of a dead body on a beach brings within days a significant increase in the number of people that some countries are prepared to take as refugees. A photograph did it. Are they idiots? Do they not know we have 3,000 dying every year, as we have been for years, drowning, and that many of them are children and women and people escaping who are refugees, that that should have elicited a policy response, not the photograph of a terrible dead body on a beach. To move quickly to the European situation where it is, some Europeans have accepted the leadership of the European Union, the commission’s proposal that there should be a sharing on a logical basis based on population, GDP, unemployment, and so on across Europe. Why should Greece and Italy carry the enormous burden because they happen to be the place where the migrants or refugees land? In fact, they are saved by battleships—battleships, no less—from the north who come down and save lives, and then dump those lives in Italy because they can’t and won’t take them home to their own country. How is it that Germany is providing amazing leadership in my view, 800,000 this year with a promise of 500,000 a year for the next five years? Or Sweden, last year 36,900? The figures beggar belief when you put them against some of the figures, which I’m only quite happy to identify if you ask me to, of those who haven’t taken their responsibility? Is there some sort of new word of international morality that defines proximity as creating responsibility? Why should Turkey have 1.7 million? Or, why should Lebanon have one quarter of its entire population? Or Jordan—why should they carry it all? What difference does it make—or, in Europe, why is that Greece and Italy—oh, because they’re on the Mediterranean. Well, does that define it? Because they’re getting too much sun that they are the ones who have to take the migrants and everybody in the north says well, no, thanks. They’re right there, and on the Dublin Regulation—a regulation which is long-past its sell-by date in my view—the Dublin Regulation demands that people be defined as refugees when they—in the place that they land. I was in Calais last week in a camp, which is an indictment of modern society—3,000 people, clear evidence of TB. I was there when there was a tear gas attack on the 3,000 people. The conditions were absolutely unspeakably terrible. And this is in France. And all of the people there want to get to Britain. Why don’t the French and the British get together and deal with it? Outrageous. Where are we going to get the sort of commitment that we need? Then two—I’m going on and on, but there are two final points that I make. Refugees, we all know, under the ’51 Convention have particular rights—the rights that I’ve already defined. Economic migrants is a description that is now being commonly used, and in the last two weeks has been used by Mr. Cameron, Mrs. Merkel, and Monsieur Hollande, and no doubt numerous other heads of government in Europe as well. And the bottom line is, if you’re an economic migrant, adieu, good bye, you’re off. We’re sending you back. Send them all back, were the lines used by Mr. Cameron. I don’t accept that. The U.N. doesn’t accept that. Migrants are people who have rights too. There are different types of migrants. There are many people who are not escaping persecution, but are escaping for their lives for other reasons. They could be starving. They could be going through the most dreadful conditions of an economic catastrophe. They could be going through an entire collapse of their feeding system. There are numerous reasons. Are we not going to have a more nuanced expression of where we stand morally in terms of our values than saying we’re going to send them home? Europe should immediately define new policies. Those new policies should allow for, for an example, humanitarian visas—so should the United States—humanitarian visas, family reunion visas, short-term visas. There are a whole lot of ways that you can facilitate terrible events. This is eminently handleable. We have over 540 million Europeans in the European Union. We’re talking about 0.1 or 0.2 or something that’s even less than that. Bill’s always good on the math here, he’ll tell you. But it’s much lower than—I mean, it is something, admirably, within our—with our—easily within our compass to do something about, instead of which we dump people in holding patterns, and we fail to assess them before they come across the Mediterranean so they have to take their lives in their hands to get there, instead of setting up some form of assessment centers in parts of North Africa that are habitable to assess and then decide that these people are entitled to travel. And finally, this is a global responsibility. Where is the rest of the world? We’ve had it before. We had it with the Vietnamese boat people. We had it—ironically, having regard to the position of Mr. Orban, we’ve had it in regard to 1956 in Hungary and 200,000 people being accommodated within jig time. Where are we now? I think we have to get global buy-in fast to the migrant issue. If, as I said, proximity doesn’t define responsibility, then it’s all of our responsibility. It’s a responsibility of humanity. And the U.S., which I should say in this administration, without being nakedly political about it, has become a very significant positive and constructive force, in my view, in the various elements of dialogue that I’ve been involved around in migration. It has to, and I believe is, standing up to the plate to take its responsibilities. So must the rest of the developed world. Others, like Brazil and Venezuela, have already taken some. We need more. And we need a global buy-in to an international catastrophe. I’m sorry I spoke too long. RUPP: Well, it’s a very broad, sweeping indictment, which we will have—of the global community. We’ll have a chance to pick your mind about that. I guess the one reservation about the sweeping indictment is the positive comments about the U.S. And you may have to talk about those as well. But let’s hear from Bill Swing. SWING: Well, thank you very much. It’s always difficult to follow Peter. And Peter’s not only a great guy, he’s a super guy, and a great partner. Thank you very much, Peter, for all your support. And thank you, George, for being such a good friend. I think the best I can do is to make three points. First one would be, I want to talk about what I call the perfect storm. Secondly, I’d like to try to project into the rest of this century what I think the trend are. And thirdly, I’d like to leave you with two or three challenges that I think we have to meet or we won’t succeed. I say the middle of a perfect storm for the following reasons—and, Peter, I think you’ve outlined it very well. I would it as follows: We have more people—we live in a world on the move. There are more people on the move today than at any other time in recorded history. That’s because the world’s population quadrupled in the last century. It’s never happened before, unlikely to happen again. And I won’t be around to be proved wrong, but we believe that to be the case. Secondly, there are more forced migrants than ever before. Already mentioned by Peter, 60 million forced migrants, 20 million refugees, 40 million internally displaced persons. Thirdly, there is greater anti-migrant sentiment—Peter, I think you outlined that very well—than in anyone’s memory. And it’s very widespread and increasing. We’re also in a period in which there is a vacuum of leadership, political courage. There is a serious erosion of international moral authority, unclear power relationships, and so forth. That’s basically the situation that we face. The second point is to say that our thesis is, first of all, that the driving forces are such that large-scale human mobility, migration, will remain a megatrend for the better part of this century, until the world’s population comes back to more normal times, somewhere around the second half of this century. It’s inevitable for a number of reasons. We’ve already talked about the disasters. We now have unprecedented disasters from the western bulge of Africa well into the East China Sea, with very few bright spots in between. We just had Ebola in the Mano River Union, Liberia, Sierra Leone and Guinea. We have Boko Haram in Nigeria. We still have instability in Burkina Faso and Mali. We have the 40-year war in Somalia, unfinished business in Libya and Yemen. South Sudan, an absolute disaster at present. Ethno-religious fighting in the Central African Republic, one of my old posts of 40 years ago. We have Syria, of course, the biggest case of all, in the fifth year of war. We have Afghanistan, Iraq, Ukraine, and a few other spots that we’re talking about. In addition, there are present—and I hope you can prove me wrong this morning—there are presently no active negotiations, no viable political processes, that offer any of us any hope that any of these crises could be resolved in the short to medium term. So there’s going to be that push factor for a long time to come. And like Peter, I’m very surprised when governments, particularly in Europe, are surprised that all these people are coming north. Let’s not forget, food rations in the Syrian refugee camps have been cut by one half. There are twice as many internally displaced persons inside Syria as there are refugees—4 million refugees, 8 million IDPs. So you face a situation in which people are sort of without hope. And so they head north. It’s what people have always done. It is mankind’s, humankind’s oldest poverty reduction strategy. We have abject poverty. We have growing socioeconomic disparity between global north and global south. We have a demographic deficit. All of our societies in the developed world are aging. China also will be in need of workers. We’ll need people at all skill levels. Therefore, it is inevitable. You have a demand for labor, you have distance-shrinking technology, the digital revolution. And we had 300 million people connected to the internet in the year 2000. Today it’s pushing toward 4 billion. People know what’s going on. They know how to get to safety. So you got all these push factors are going to mean that it is inevitable that you’ll have large-scale migration for the period ahead. It’s also part of my thesis, it’s also necessary if we’re going to—if jobs are to be filled, skills to be available, and economics to flourish. We won’t get by. We’ll need people at all skill levels—perhaps less so the U.S. and Canada, because we have a very active migration policy. And finally, it is highly desirable to have migration if we have the right policies. But our policies simply have not kept up with human reality. Mayors understand it much better than national politicians. Mayors have to provide the jobs, the shelter, the security and all of that. So I think it’s a—I call a high-road policy, multiple entry visas, dual nationality, portable social security benefits—all kinds of things, if we can just be a little smarter in how we deal with it. Peter, you founded the WTO. And that was for free movement of capital, goods, and services. What makes that happen? People. There’s no free movement of people. And this is the element you’re talking about that’s actually missing now. Finally, let me throw out to you two or three challenges. So, point one, the security situation is a perfect story. Point two, large-scale migration is inevitable, necessary and desirable. Point three, the challenges. This is what we have to have if we’re going to succeed. First of all, we have to change the public narrative on migration. Right now, it is toxic. It is poisonous. Migration has a bad name. And I can tell you, this city is built on the backs and with the brains of migrants—continues to be so. Most of our Nobel Prize winners weren’t born in the U.S. Forty percent of all patent applicants come from people who were not born in the U.S. And many other countries have the same experience. Historically, overwhelmingly positive. So that’s the first, you got to get back to a historically correct narrative, that narrative basically that’s essentially positive. Secondly, and this may be even more challenging, we’re going to have to learn to manage inevitably growing multiculturalism, multiethnicity, multireligious. It’s happening. We’re not going to get by without it. More countries are going to have to become all of those things, inexorably so. And if we don’t learn to manage diversity, it’s going to go very badly. Finally, and I’ll stop with this, George, the third challenge is related to the first two. Somewhere, we’ve got to strike a balance between national sovereignty and individual freedom, between national security and human security. And we’ll never get it entirely right, but somewhere in between those two parameters lies a correct, appropriate, responsible and human migration policy. Thank you. RUPP: Well, thank you both. We ordinarily would have some conversation between the two of you—among the three of us, but it seems to me you have so categorically framed the issue, both of you, and with such a clear point of assertion that is contrary to the conventional wisdom in a great many countries, that we should open it up for all members to participate now, rather than have more exchanges among the three of us. So let me invite all of you to pose questions. We’ve had a really major challenge placed in front of us about the ways in which we collectively, the human community and the global community, need to respond more effectively than we have responded. And we’ll need to respond indefinitely into the future, if the kind of trends that Bill has outlined are accurate. So questions. Yeah, please, when you have a question, stand, wait for the microphone, say your name and organization and ask a question, rather than give a speech. Q: I’ll try. My name is Saskia Sassen. This is a question really to both. And I really appreciated the comment enormously. Here is a possibility, that we’re still using the language—so it’s a question, actually, that I would like you—so let me frame it as a question. Are we still using the language of migrations and refugee flows, when perhaps what we’re witnessing and the difficulty of handling it has to do with the fact that there is a massive loss of habitat on all kinds of sides? We have focused a lot on the wars. There are 40 countries right now that have armed conflicts in them. But there is the land grabs, the plantations especially in sub-Saharan Africa, but other parts. You know, there is a lot of the environmental destruction. Literally, there are communities that are being blown out, you know, by droughts or by excess water. So could it be that we’re actually entering this new era where something rather deeper is happen than what we have historically thought of as migration and refugee flows, even though those terms are still adequate? I’m not rejecting the terms. RUPP: OK, well, why don’t we start with you, Peter, and then—and then move to Bill. SUTHERLAND: Oh, I mean, I agree. There are a whole lot of different causative factors. Some of the causative factors today are different than those which existed before because of environmental degradation and because of different types of relationship issues between people, and people are being moved out of their habitats to other areas. This is part of the mosaic which we’re trying to handle. But in the end of the day, it comes down to the same issues that Bill has been talking about. We have to create societies, both in countries of origin, transit, and destination that value lives equally. I mean, the problem here, to my mind, is the fundamental value system that we believe in. If we believe in the dignity of man and the equality of man, wherever we get it from, our religions or the enlightenment or wherever you want, then this business of it being ours and the habitat being ours and—we have to change. I mean, it becomes platitudeness for me to repeat it anymore, but that’s what we have to deal with. SWING: Though clear, as Peter says, the environmental degradation, climate change is going to also be an added push factor, we have—I just met with the president of Kiribati, one of the Pacific island countries. And he is basically on record as saying—they’ve asked him, you know, what can the West do to help? His answer is, nothing. It’s too late. They know their country will disappear. SO he’s buying land in Fiji. And so we’re going to have a new form of statelessness, not in which a state rejects you, but in which you actually lose the state physically. So that’s clearly an added concern that we all have. Places like the Maldives are a concern now that they may also—so we got an additional factor there, another push factor. RUPP: Well, so it sounds like it basically adds yet one more very forceful element to this long-term trend that you’ve described. RUPP: And it suggests our responding each day to whatever the latest few refugees that went into this or that country and not have a long-term strategy is fundamentally misguided. And that’s really the point you both were making. Q: Thank you very much. Joanna Weschler, Security Council Report. I have a quick question for both speakers. For Mr. Sutherland, you mentioned that things like the European Convention is past due. It seems very much that the 1951 Convention is also past due. Is this a moment when there is a very urgent need for new legislative normative work, or is it not been worth looking at it because it always takes so much time and things are happening regardless? And to Mr. Swing, you said something which rang very true with me—that mayors are doing much better than national politicians on refugee issues. And I just came back from Madrid, where you have on the city hall a gigantic banner, refugees welcome, even though Spain as a country is not doing exceptionally well. Madrid, I think, is. But why is it? Mayors are elected too. So you could make all the same arguments that they need to be cautious in what they do. And yet, they seem to be doing differently. Thank you. SUTHERLAND: On the normative end, I’m very reluctant—not that I could—but if I had the power to open up a normative debate on extending, for an example, the definition of refugee to cover others who are in mortal peril in some way, I would be very slow to recommend it because by opening that Pandora’s box you’d more likely to end up with a debate about restricting those who are entitled to the status of refugee and the support of it. I believe, therefore, that opening a normative discussion—much, though, as a lawyer particularly I admire and respect having international norms that are enforceable—I’d be very slow to open a debate on that subject now. I think that we have to rely on different mechanisms for the development of normative responses. I think the European Union—I’ve said earlier that I think the commission is doing a bloody good job, Juncker in particular, has been putting forward proposals which a vast majority of member states are in favor of, including the quota system, which is a testimony to how much the European Union has succeeded, now how much it’s failed. And when I read the newspapers in some countries not so well-disposed to the European Union, this is an indictment of the European Union process. It’s the opposite. It is an indictment of the countries that are frustrating the European process, which would have an objective mechanism normatively based on European law, which would allow the sharing, for an example, of refugees. SWING: I might just make one comment on what Peter’s saying. Absolutely right. I think what you’re faced with here is you have—first of all, you have historical amnesia, that Peter mentioned in his remarks, 200,000 Hungarians moved out 60 years ago next year. Two-hundred thousand moved out to be greeted with open arms by everyone. That’s been forgotten. You have institutional paralysis. I agree with Peter. I think the European Commission President Juncker particularly doing a very good job, but it’s very difficult to get 28 countries then not to go back home and follow their own instincts rather than (that ?). And thirdly, you have something I would call a psychological block. For four centuries, Europe has peopled the world, continent of origin. And now for four decades, they’ve become a continent of destination also. And that takes a psychological adjustment, that we’re now receiving people rather than sending people. On your question on the mayors, look, I’ve been to a couple mayor’s conferences. I met with a lot of mayors, many themselves migrants. The mayor of Rotterdam, for example, is from Morocco. I guess the reason—they get it because they have to. I mean, they’re on the ground. That’s where the rubber meets the road, so to speak. They have to provide the jobs and the security and everything. Yes, they have to be elected, but a lot of those migrants are going to help elect them. They’re looking at future voters too, which makes me wonder sometimes how we can be so—even as a politician, it’s your interest to be interested in migration. The sooner you can make them citizens, the sooner they can pay tax and they can vote. Robots can’t vote and they can’t pay tax. So we need to look at it from a national interest point of view. By the way, just a free advertisement, George, if you’ll permit me. Because of this, we are holding a migrants and cities global conference in Geneva next month, inviting all the mayors of the world. I was just in Guangzhou, invited the mayor of Guangzhou. He’s coming. They’re doing some interesting things. We want them to teach us, and we want to learn from them and then learn from one another lessons learned, best practices, how to do it. Thanks. RUPP: OK, thank you very much. Yes. Bill, you mentioned that of the 60 million people who we’re concerned about, 20 million are refugees but 40 million are IDPs, as within their own countries, and entitled to even less protection. What is your prescription as to what the world should be doing to deal with IDPs, as opposed to the smaller number of people who are actually refuges? SWING: Yeah. It’s a very, very important question because, quite frankly, IDPs tend to be forgotten. They have no constituency. Refugees will always have a good constituency in Washington, whichever party is in office, because—and that’s right. It should be. IDPs are just—less known about them. We have right now, for example, 300 people inside Syria in at least 12 of their governorates every day, trying to find health assistance, food, water, shelter, what we call non-food items, and other things. But they will never get the support that refugees do, because—I don’t know, they’re not covered by any convention. Peter, you mentioned it, they’re not covered by conventions. Nobody’s going about creating a convention for them. But we have to somehow keep them in the public view so we don’t forget them. But I can tell you, they’re very, very underfunded. I think at about somewhere of 30 to 40 percent of all the appeals—maybe 30 percent, 40 percent actually is responded to. But it’s an ongoing challenge for us. So we’ll try to do our best to keep it in the public eye. RUPP: As long as I acquiesced to your advertisement, I will just mention organizations like the International Rescue Committee certainly do not observe the distinction between IDPs and refugees in terms of our programs. And so I would say the IRC is at least as involved with internally displaced people as with refugees in the—in the 25 countries in which we operate. But that’s, again, a very small gesture in the direction of dealing with an enormous problem. SWING: And there’s a third group of people that’s even more forgotten. The high commissioner for refugees and I, we flew down to Libya in March of 2011. They were coming across the border, 6,000 a day, into little Tunisia. And the people were, you know, taking out of their own pockets, feeding these people helping them, great. And by the way, we’ve never given sufficient recognition to the six neighbors of Libya and the four neighbors of Syria who, to this day, have kept their borders open to—this is what we call humanitarian border management. Let them come; they’re suffering. But when we flew down there, at the time there was all these migrant workers in there. There were a couple million. Egypt took back a million. We, together, took out 250,000 migrant workers, returned them to 54 countries at a cost of about $125 million. And they don’t figure in anybody’s contingency plans, but that’s another group that gets forgotten. As we speak we are flying people out of Sanaa in Yemen to Khartoum, and we’re flying—we’re taking Somalis and others across the Red Sea into Djibouti to safety. So it’s an ongoing thing, but they’re forgotten. Q: Bhakti Mirchandani, One William Street. What would you most like to see from the impact investing world and the financial sector to help with the humanitarian crisis? Is it subsidized loans to microfinance organizations working with refugees, is it supply-chain lending to U.N. food agencies, or something else entirely? What are your top one or two things you’d like to see? SUTHERLAND: Well, all of the above, I would say. The investment banking community, in common with all other wealthy communities around the world, have a responsibility, obviously, to help in every way that they can. I know of some who have already opened up for contributions on an individual basis, and very substantial money has been forthcoming, I understand, in the last couple of weeks from individuals. But investment banking and banking generally has a productive role to play in the global economy, and I think can do more. It can do more by creating think tanks within their own operations, either individually or collectively, to look at how they can provide greater access to capital for productive investment and infrastructural investment, not on the basis of altruism but on the basis of self-interest. I think that it has to become a greater focus, emerging markets for investment strategy, and there can be an element in this of altruism, as well as the well-known propensity of trying to make a buck in the banking business. I think that there’s a lot that can be done, therefore, in the whole process of globalization, which is something that I believe in. Globalization has brought 1.6 billion people out of abject poverty, but they’ve been in India and China. It has not succeeded in bringing people out of poverty, for an example, in Sub-Saharan Africa, largely because of the absence of human and physical infrastructure. And the—and the banking sector can play a role there, too, by promoting investment into areas, and also ensuring that areas of that kind are free from the corruption that is the structural deficit most imperiling the whole area of development of economies in the poorer parts of the world. But one could keep going. SWING: Peter said it all. Q: I’m Rick Donner. I’m with Moody’s Investors Service. I have a question. Thank you very much for your presentation. Very interesting. My question is this. So we have this week major world leaders attending the U.N. You mentioned that there’s a meeting today that is intended to address the migrant crisis. My question is, do you think anything realistic will come out of this? Do you think there may be a framework for addressing it on an international level? Do you think there will be more money committed to this crisis? I’m just wondering what you think might realistically come out of the discussions this week. Thank you. SUTHERLAND: Well, I think that if we get the usual rollout of platitudes and generalities from heads of government and heads of state in the face of this particular concrete crisis that we are facing, that that will be a shame. And I hope that those who are going to speak and those who are advising them make concrete proposals and suggestions, rather than generalized throwing hands in the air and expressing concern about humanity—which, frankly, the U.N. has had too much of, with too little of the practical ideas that are necessary. So how they’re going to actually behave today I don’t know, but it’ll be very interesting because if you look at the list of speakers—which Bill and I are both partaking in—the list of speakers are really tremendously, tremendously impressive. Let’s just hope that they actually deliver the goods. SWING: No, I think that’s actually right. I guess, though, that if you want to try to pull something positive out of this, I think the very—in some ways, this has been a—almost a mini General Assembly on migration. Virtually every speaker has mentioned it—President Obama, of course Pope Francis; mentioned certainly by the secretary-general, who’s been very, very engaged on this issue. I’m very—I think we are both very grateful to him. He has, I think, given his full support on the issue. That itself is something that wouldn’t have happened even a year ago. If someone had told me in 2008 that we would be—have this much exposure in the media now on migration, I would have thought they were probably not accurate at all. So I think that itself is good. Will it go beyond this? It’s hard to say. But clearly there are forces there now that are going to keep this issue before us for some time to come. What we’ll get in concrete action, not clear yet. Q: Thank you very much. Patricia Rosenfield, the Rockefeller Archive Center. So I wanted to go back to the challenges that you posed at the beginning, Bill, and that Peter also elaborated and I know George knows a great deal about, and particularly the historically correct narrative that might be put forward that—I’d be interested in what the three of you think might be the right way of framing that historical narrative that might lead to changing public opinion. Because I think we have people who are really at different levels very knowledgeable and wanting to act, but if there’s not broader public awareness and commitment to it, it won’t happen. So where is the historical narrative that we might draw on for that? SWING: Well, we have—Peter, if I might just mention, we have now started a social media campaign on the positive contributions of migrants. We’re letting migrants speak for themselves. At our council meeting we have 157 member states. We meet at the end of November every year in Geneva. And we have—always have a segment called “migrants’ voices.” We had people like Dikembe Mutombo, a Congolese who—a big basketball player—(chuckles)—and they tell their own story, both the troubles they had integrating, the tough times, and what’s it’s like, and what good things happened to them. We let them tell their own story. You take a fellow like Mo Farah. The British will—he is not a Somali. He’s U.K. Didn’t he win three gold medals? Of course he did. That’s the kind of story you want to be told. We want to keep those stories out there, the positive contributions migrant(s) make. That’s one way we can do it: let the migrants speak for themselves through the social media. I think that’s probably the most active campaign we have going right now. SUTHERLAND: I think that we need factual arguments on a whole range of different subjects to change the national debate, apart from the emotional connection that we all should feel when we see horrible events. I see U.N. DESA, Population Division of the U.N., here. I think facts about demographics are terribly important. I mean, the lowest birthrate in the world, Germany, the fact that it probably needs 1.5 million a year—if I’m correct on that figure—to maintain in 30 years’ time the ratio between retirees and working population. Italy, Spain, and so on, in the European context. The same issues, and even more dramatically as indicated by Bill, in regard to—in regard to Japan. I think that that’s very important. I think that there’s a wealth of evidence about the positive contribution of migrants right across the world, and European without exception. Migrants have lower unemployment rates. They make positive fiscal contributions rather than being a burden on national exchequers. They have a higher level of innovation. And they have a greater appetite for education. These are facts that have to be put out there. So I think facts are an important part of this. But having said all of that—having said all of that, we have to get up there publicly and we have to fight. And from the little tiny—and I’m a tiny player in this play—I think getting to the media, to me, is key. Getting to the media is key. We have to be out there talking to the media. It’s great talking to you guys, but I’ve—I suspect from nodding heads that it’s preaching to the choir. And I mean, we really have to preach to the choir to get you to preach to the non-choir, but we also have to preach to the sort of crackpot, lunatic brigade that dominate so much of our media in the modern world and are creating a toxicity which is a bloody disgrace. And we have to start saying it. Well, we are saying it, but that’s all we can do. SWING: George, can I just add one point? Peter reminded me of it, and it’s absolutely right. I think the evidence base is extremely important. People have fears, and we have to deal with these fears. They’re not real, but we have to tell them why they’re not real. We’re dealing with stereotypes. So what are the fears? The fear is, 2008-2009 recession, they’re going to take our jobs. Second fear, post-9/11 security syndrome, every tourist is a potential terrorist. Third one—the most important one—fear of loss of personal or national identity. We have to move the—we’ll never get anywhere with the debate on identity. That person doesn’t look like me. Why are they wearing those funny clothes? What’s that funny accent? You know, all these things. We did a survey in 2011. Every country in the world we surveyed, including the U.S., grossly overestimated how many foreigners were in their country. The U.S. thought it was 30 percent. In fact, it’s down around well below 20 percent. Italy, double also. So we move the debate from a debate about identity to a debate about interests and values. Can the warmth of our welcome, the smoothness with which people are allowed to integrate, can we then not hope that they will also share our values and interests? This is really what it’s all about. But we’ve got to do that. If we don’t, we’ll lose. RUPP: So both address the values questions, but then also get the facts out. RUPP: I mean, just the hypocrisy of Hungary, having itself benefited from out-migration, not being willing to allow in-migration, is—I mean, there are various concrete data that can make a difference. And if we put it into the global framework that both our speakers have put this set of issues in, then it’s clear these are very long-term patterns that we have to understand far differently from the way we’re understanding them. And it’s not that the fears aren’t real. They are real, they’re just based on a lot of distorted information. We have time for one more question, and so who would like to have that honor? Yes. Q: Hi. Chris Bashinelli, National Geographic. Thank you so much for everything that you do. It seems to me that the most important issue is the decreasing of that “I,” of that self-importance. And jumping off of what you’ve been saying about the media, what I’m curious about is how to reach the large portion of the population that is not interested in this subject overtly—you know, people that are watching MTV or reading People magazine or watching TMZ—because this is the portion of the population that I—that I try to reach. And do we reach them on a practical level, or on an emotional, altruistic level? And how do we do it? I think—I think you do it both ways, emotion and practical. But you know, I know that there’s a huge body of public opinion that isn’t influenced by this debate at all. They have prejudices which are inherent, they’re not likely to change. Of course that’s true. Equally, there are a lot of people who are open to being explained to, to being trained. And it’s amazing when you actually sit down and react—watch a reaction to an emotional story. I mean, the incredible openness of German society, which you might say has a lot to pay for in terms of political realities of its—the appalling acts that were committed in the name of German nationalism—but when you look at the opening of homes, the embracing of people—I’ve been in—I’ve been in camps in Rome where I was stunned by a constant flood—no government support for the particular two places I was in—a flood of women and children arriving in with cars full of food, full of clothing, wanting to teach. Incredible. So wherever their values came from, the values of the average European—and I’m sure the same goes for the United States, and I’m sure it goes also for many Muslim countries—and indeed, in Calais, one of the most active NGOs was a crescent NGO bringing in from Britain help for poor people and so on—there is a huge audience. Mankind is basically good. So I think it’s we just keep plodding on, selling a record which we can all believe in and put our hand on our heart and say is something we can be proud to be associated with. But I think we have to be more vociferous, all of us. So clean up our language. Give them the examples. And give them the examples, then, of, you know, migrants who’ve done—the contributions they’re making. They’re not angels, but I don’t think all of our nationals are angels either. So we have to give a balanced picture of it. Just have to keep—as you say, keep nattering away at it. RUPP: Well, on behalf of all of us, I want to thank both of you. You’ve taken a set of issues that is in the press now every day because of the migrants or refugees or asylum-seekers going into Europe and placed it in a—in a much broader context that helps us to realize that this is only the tip of the iceberg that we’re seeing in the papers each day. The problem goes back much further and will be with us going very much further forward. And you’ve done an excellent job of setting that broader context for us, and it helps to do it at the CFR. And all of these ambassadors will now go out and make sure it’s spread far and wide.